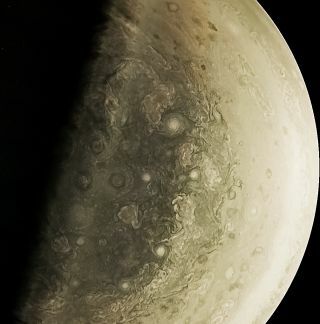 The JunoCam aboard NASA's Juno probe instrument snapped this photo of Jupiter during a close flyby of the gas giant. The first science results from the mission are expected to appear in 2017. This artist's impression shows what it might look like on the surface of Proxima b, a planet that orbits the star nearest to Earth's sun. Images taken by the Hubble Space Telescope of Jupiter's moon Europa contain what appear to be water plumes erupting from the moon's surface. The images were taken in 2014, but the results of the analysis were not released until 2016. The dwarf planet Makemake that orbits the sun beyond Pluto was discovered to have a tiny companion satellite. This artist's concept shows a SpaceX uncrewed Dragon capsule on the surface of Mars. This year, the private spaceflight company announced plans to send capsules to Mars as early as 2018.